Today’s post is our first visit to a book recommended by a reader – Selecting Shares That Perform, by Richard Koch and Leo Gough. This is a book I’d never heard of until I asked for suggestions when completing our look at The Naked Trader. It’s the fifth (and recent) edition of a book that has been around for more than 20 years, so it will be interesting to see how well it has aged. It’s an FT book, from back in the days when they were still part of Pearson. 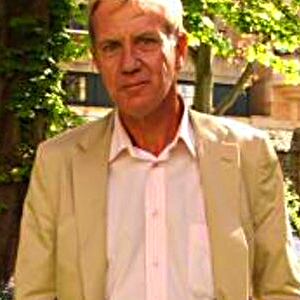 Richard Koch is a prolific author, having written more than 20 books, mostly about the Pareto principle (the 80/20 rule). He’s also a successful investor, mostly in private equity, and worth more than £100M. 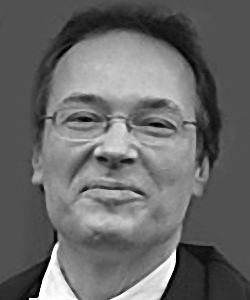 Leo Gough is a financial journalist that I couldn’t find out too much about. He’s written several FT books and has also edited investment newsletters. It’s a fairly slim volume (219 pages), so I hope that we can get through it in four articles. This section has seven chapters, and the unifying theme is that the individual investor need not be afraid of going up against the institutions. There are good reasons why you should be able to do better. The first chapter deal with why most of your money should be in the stock market. Because it has the best (long-term) returns. Of course, there will be downturns and crashes, so you need a long-term outlook, and a long investment horizon. The book says five years or longer is long-term, and you should have 90% to 100% of your spare cash (outside your home) in the market. For 1 to 3 years, try 25%. For 4 years, try 75%. For less than 1 year, avoid stocks altogether. They also recommend regular investing, to avoid putting all your money in at the top. And you should use the same approach to taking it out – a bit at a time. They also recommend avoiding the stock market when everyone else is. This means at new highs, or when the market is in the news, or your cleaning lady is talking about it. They go further and suggest that you shouldn’t invest in the market its PE is above 17. I think this is a bit draconian, and would keep you out of a lot of bull markets. To be fair, they don’t say “sell everything”, just “don’t add more”. They recommend UK stocks (plus some US ones) and the FTSE-100 in particular for beginners. I think this lack of global diversification is a mistake. It’s easy to access international markets through ETFs and investment trusts, though stock-picking abroad is more difficult and expensive. Chapter two looks at index tracking. They look at both tracking using a fund, and DIY tracking. DIY tracking is hard work and expensive, compared to ETFs that will do it for 0.07% (FTSE-100) or 0.20% (FTSE All-Share). They suggest making things simpler and easier by starting a club to share the burden, or by randomly sampling say 20 stocks from the FTSE-100. The authors aren’t keen on index tracking and use a few examples from the second part of the book (Ten Ways That Work) to illustrate how you could do better with carefully chosen stocks. But they recommend that you try out their methods gradually, with small amounts, or by paper trading for six months. For me, the key advantages here are the lack of a short-term focus, and the ability to buy smaller companies (which outperform in the long-run). When the first edition of the book was published, this record-keeping would have been on paper, but today you would use a spreadsheet – preferably one that can provide live pricing. Order the stocks in descending %age gain (since the previous valuation) order, and mark in red the ones that are lagging the index. The authors recommend recording the ranking of stocks at each valuation, so that you can identify the laggards through a sequence of low placings (perhaps as few as two), and remove them. Chapter six covers why you need your own approach, and how to choose one. Not all approaches are suitable for all people. Chapter seven looks at personality in more detail. Richard Koch was taught about this area by Hal Leavitt, and it is a version of Leavitt’s framework that the book uses. The framework was originally designed to classify leaders, but Koch believes that it works for investors, too. The authors provide a quick 20-question test to work out which type you are. Are you most like Hitler, the Daleks or Attila the Hun? I took the quiz on your behalf and scored 40% for visionary, 50% for doer and the maximum 100% for analyst. This makes me suited to all but the first two investing approaches from the book (rainmakers and backing winners). You can further refine your selection by using your answers to the questions in chapter six on how investors vary. 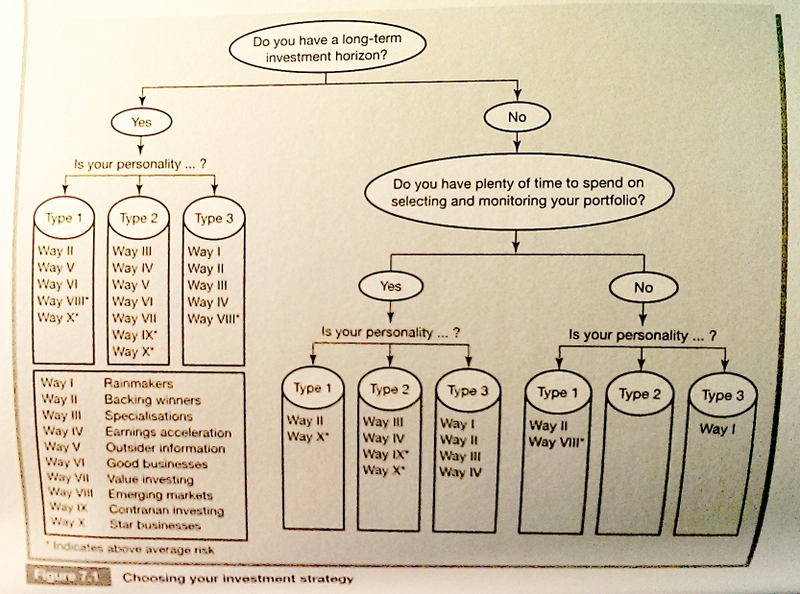 Here’s a (bad) picture of the decision tree from the book. I have a long-term investment horizon, so I still get to pick from any but the first two Ways. 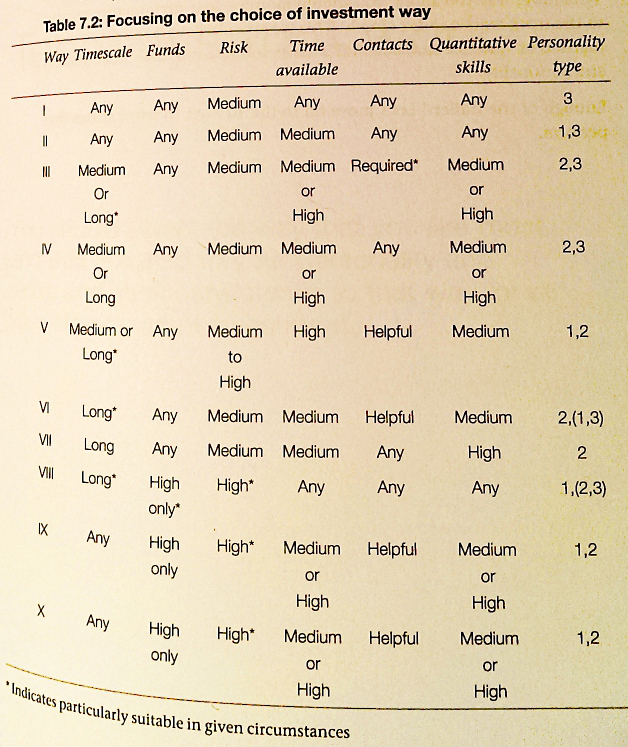 And here’s a (not quite so bad) picture of the table highlighting the characteristics of each Way. Looking at this, I can also rule out Way 3 (Specialisations) because I lack the contacts. So I am now down to seven of the ten ways. That’s it for today – we’ve covered 60 pages, or around 27% often book. I’ll be back in a few weeks with our first look at the Ten Ways That Work in detail.